HIGH PROTEIN & GLUTEN FREE: Packed with 19G high quality protein and only 7G of sugar. Gluten Free. Boost your metabolism, preserve your health, and achieve your short-term and long-term fitness goals. Infused with Guarana caffeine and both MCT oil and Omega 3 oils to feed your brain cells and keep your body moving. The yummy gluten free cookie crumbles and velvety milk chocolate will make your brain fire on all cylinders and help you stay woke! CLEAN & NATURAL INGREDIENTS: Made from Protein Blend (soy protein crisps (soy protein isolate, tapioca starch), whey protein concentrate), Peanut Butter, Gluten-Free Cookies (cane sugar, pea starch, potato starch, white rice flour, cocoa powder, palm oil, modified palm oil), Maltitol, White Chocolate (sugar, palm kernel oil, whole milk powder), Vegetable Glycerin, Palm Oil, Milk Chocolate (sugar, palm kernel oil, cocoa powder), Natural Flavor, Guarana, MCT Oil, Omega 3 Oil. " PRE-WORKOUT SNACK: The perfect pre-workout energy boost or post workout performance recovery to help you make strides towards your health and fitness goals. MEAL REPLACEMENT: Constantly on-the-go? Running late? Miss breakfast? 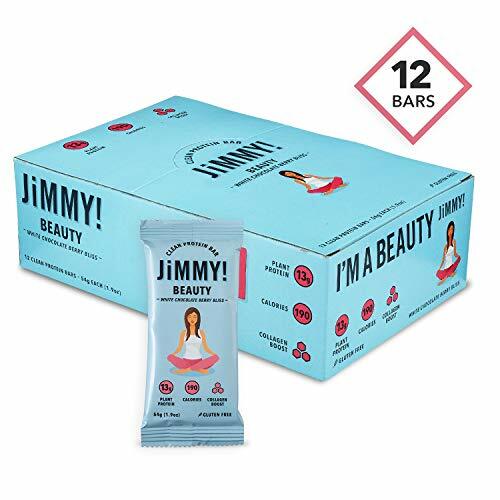 JiMMY Bars give you energy and keep you full for up to 6 hours. Final Price as low as $19.99 Shipped!